The team directing the epic trek of NASA’s Curiosity rover across the floor of Gale Crater has adopted new driving strategies and a new way forward in response to the unexpected wheel damage caused by driving over fields of rough edged Red Planet rocks in recent months. This week, engineers directed dune buggy Curiosity to drive backwards for a lengthy distance over the Martian surface for the first time since landing. The SUV sized vehicle apparently passed the reverse driving feasibility test with flying colors and is now well on the way to the exciting journey ahead aiming for the sedimentary layers at the base of towering Mount Sharp – the primary mission destination – which reaches 3.4 miles (5.5 km) into the Martian sky and possesses water altered minerals. “We wanted to have backwards driving in our validated toolkit because there will be parts of our route that will be more challenging,” said Curiosity Project Manager Jim Erickson of NASA’s Jet Propulsion Laboratory, Pasadena, Calif, in a statement. On Tuesday, Feb. 18, Curiosity not only drove in reverse, but the 329 feet (100.3 meters) distance covered marked her farthest one-day advance in over three months. And she is also now roving over the much sought after smoother Martian terrain, as hoped, when the team decided to alter the traverse route based on high resolution imaging observations collected by the telescopic camera on NASA’s Mars Reconnaissance Orbiter (MRO) circling overhead. The goal is to minimize wear and tear on the 20 inch diameter wheels. Engineers were forced to devise new driving techniques and consider a new route forward after the aluminum wheels accumulated significant punctures and rips during the past few months of driving over fields strewn with sharp edged Martian rocks. “We have changed our focus to look at the big picture for getting to the slopes of Mount Sharp, assessing different potential routes and different entry points to the destination area,” Erickson said. But to reach the smooth terrain and the science rich targets located on the pathway ahead, the six wheeled rover first had to pass through a gateway known as the ‘Dingo Gap’ sand dune. “Moonlight Valley” is the name of the breathtaking new locale beyond Dingo, Curiosity Principal Investigator John Grotzinger, of Caltech, told Universe Today. Curiosity crossed through the 3 foot (1 meter) tall Dingo Gap sand dune with ease on Feb. 9 and roved on to targets in the “Moonlight Valley” and the region beyond. “Moonlight Valley has got lots of veins cutting through it,” Grotzinger told me. Since passing through the Dingo Gap gateway, Curiosity has traveled another 937 feet (285.5 meters) for a total mission odometry of 3.24 miles (5.21 kilometers) since the nail biting landing on Aug. 6, 2012. “After we got over the dune, we began driving in terrain that looks like what we expected based on the orbital data. There are fewer sharp rocks, many of them are loose, and in most places there’s a little bit of sand cushioning the vehicle,” Erickson said. 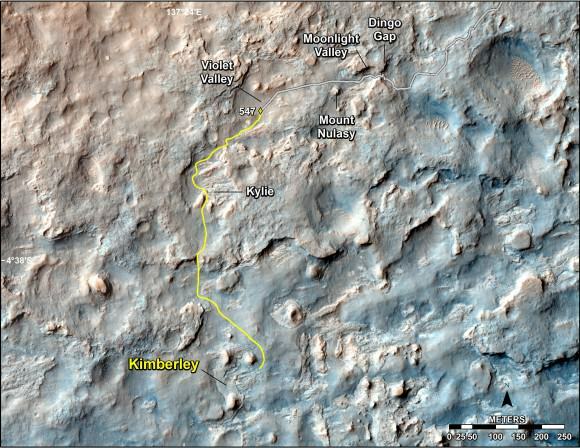 Curiosity’s near term goal is to reach her next science waypoint, named Kimberly (formerly called KMS-9) which lies about two-thirds of a mile (about 1.1 kilometers) ahead. Kimberly is of interest to the science team because it sits at an the intersection of different rock layers. The 1 ton robot may be directed to drill into another rock at Kimberly. If approved, Kimberly would be her first since drilling operation since boring into Cumberland rock target last spring and since departing the Yellowknife Bay region in July 2013 where she discovered a habitable zone. To date Curiosity’s odometer stands at 5.2 kilometers and she has taken over 118,000 images. The robot has about another 5 km to go to reach the foothills of Mount Sharp. Meanwhile, NASA’s sister Opportunity rover was just imaged from orbit by MRO while exploring clay mineral outcrops by the summit of Solander Point on the opposite side of Mars at the start of her 2nd Decade investigating the Red Planet’s mysteries. And a pair of new orbiters are streaking to the Red Planet to fortify Earth’s invasion fleet- NASA’s MAVEN and India’s MOM. Stay tuned here for Ken’s continuing Curiosity, Opportunity, Chang’e-3, SpaceX, Orbital Sciences, LADEE, MAVEN, MOM, Mars and more planetary and human spaceflight news. surprised they didn’t anticipate rocks, large and sharp…cant change a tyre up there :)…love the new pics but this Rover hasn’t been as endearing as Opportunity and Spirit..not sure why? Don’t make her sink into the sand like Spirit did! For sure, but with her power source, she could feasibly last for over a decade… but perhaps hindered in one spot for an amount of it sorely needing Martian Roadside Assistance… lol! It’s unfortunate that they can’t use the onboard laser and manipulator arm with some of the iron or hematite laying around to patch the holes. It makes no sense that the wheels weren’t thoroughly tested and this problem identified during testing here in 3x the gravity. I’m aware that the wheels are capable of working if damaged or knocked out of round, but these seem like problems expected to be caused by a bad landing, not from something as mundane as going from point A to point B.
I don’t understand why NASA didn’t go with a proven design like the wire wheels used on the lunar rovers or even Lunokhod 2. Only 5.2 km on the odometer and they’re already worried about wheel longevity. I realize there were weight constraints, but what good is a rover that doesn’t rove? Especially one with a power supply designed to last for decades. There are just too many corners being cut at NASA and it’s leading to mistakes being made. I have a really uneasy feeling about future missions. Makes no sense at all. At all! How simple is building a lightweight yet rugged wheel compared with everything else that was involved here!!! Next PostNext Weekly Space Hangout – February 21, 2014: Two-Man Show!